Two media students from Manipal University, Dubai have made it to the Rolling Stone internship program to which they will be able to work for one of the most re-owned and prestigious magazines in the world. 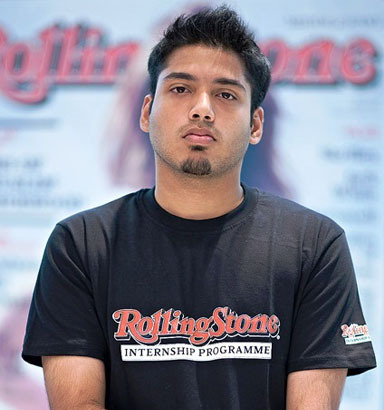 Rolling Stone magazine’s Middle East edition launched the program for students who are interested in making a mark in editorial, creative photography and digital marketing. Representing Manipal University, Dubai are first year undergraduate media and communications students, Lavanya Narayan and Brendan Lopes who made it to the top 15 finalists. Lavanya and Brendan have been handpicked by an expert judging panel who studied their submissions in editorial and photography categories respectively. The 15 students are currently divided into three groups, each equipped with one from each category i.e editorial, photography and a digital marketing in order to employ all three tools to their advantage and work as a team to promote themselves to garner enough votes to win the internship. “Being a freshman, being selected to be a finalist for this internship is definitely a huge deal for me. 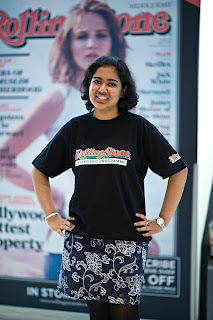 I hope to become an editor of a magazine like Rolling Stone someday, and this is surely a start towards that goal” says Lavanya Narayan whohas been selected for the journalism category. Aspiring photographer, Brendan Lopes said, “I applied for the internship because it would be a great jumpstart to my career to work for such a huge company like Rolling Stone, and also photography being one of my most favorite hobbies, this gave me a platform to convert my hobby into a profession”. follow the instructions below the video to vote for them! The participants have been given specific challenges in relation to their categories, and these needs to be completed in three weeks. The candidates will be encouraged to blog, video and post online their experiences whilst gathering the content for their challenge, which will be posted online, where their supporters will be able to vote for their favorite. According to Lavanya, competition for such an internship isn’t easy, “Everyone is here to win. Everyone is here to accomplish their goals. But we are very cordial and friendly with each other”. Once the final challenge has been completed and submitted on the due date, the magazine selection team will select the results of the public vote, one from each category. The three winners will be awarded the internship placement at Rolling Stone Middle East that will take place between June and August. The winners will be declared at the announcement event on the 30th May. Show your support and vote for Brendan Lopes and Lavanya Narayan!